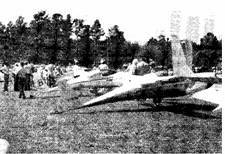 bugs on aircraft which already have the GU canard airfoil. At QAC we have never stopped researching this problem. Some recent tests indicated that a possible solution has been found. To understand how we have “cured” the problem, we must first know what causes it. 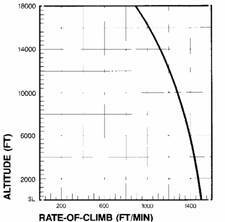 Research by NASA, QAC, and others indicate that contamination on the leading edge of the GU airfoil causes the boundary layer of air moving over the surface to thicken. As the boundary layer gets thicker, it can no longer follow the top surface and begins to separate at the trailing edge. This separation moves forward increasing the drag and decreasing the lift of the airfoil. This can be seen by the pilot in rain. He will notice that droplets of water will appear to be stagnant on the top rear surface of the airfoil. This clearly indicates separation. The solution we have found is the application of Vortex generators to the top surface of the canard airfoil. 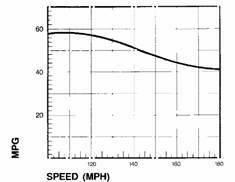 Vortex generators provide a powerful mixing of the boundary layer and delays the separation. sides and flew with and without tape transition strips with no apparent change in performance or elevator position. These tests are just beginning and much remains to be done but we are convinced that this will solve the problem. Many builders did not receive the letter that QAC sent out regarding the new heads for the Revmaster engine, so we are repeating the announcement here. We have asked Revmaster to extend the deadline on this option and they have graciously agreed. As mentioned in Newsletter # 22, Quickie has been testing some new cylinder heads and lower induction pipe for the Revmaster engine. This testing has now been successfully completed and the package is now approved. The new heads feature larger stainless steel valves, improved seat material, larger ports, and combustion chamber modifications to unshroud the valves. 1. At least a 10 mph increase in both cruise & top speed. 2. At least a 200 fpm increase in rate of climb at all gross weights. 3. Improved mixture distribution between the cylinders. 4. Equal or better cooling. 5. At least equal fuel economy at the same cruise speeds. A special rate has been established for QAC customers until August 6, 1984 of $650.00 exchange. After that date the price for this option goes to $750.00. Anyone who is flying will be given priority over other orders. A core charge of $250 .00 has been established. What this means is that you need not send in your old components until after you have received the new ones. This way no one’s aircraft will be down while waiting for delivery of this option. The core charge will be refunded within 10 days of receipt of the original components. Revmaster will do the installation for anyone who wishes at their Hesperia, CA facility for a labor charge of $100.00. You may order this head option thru your local dealer or QAC and if you have any questions, don’t hesitate to call. 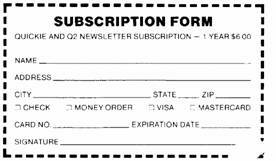 There will be a discount of $1,000.00 for those who purchase 1A, 1B, & 2 all at one time after August 6, 1984. Those of you who have only purchased Package 1A should keep the deadline in mind. Quickie Aircraft has been using and testing Bel-Ray’s Aero-l synthetic aircraft oil for over two years in a number of different aircraft and engines. Aero-1 is FAA approved for both Lycoming and Continental engines including turbo charged models. It is STC’d for 100 hour oil changes. Our experience indicates that oil consumption is drastically reduced with Aero-1 as compared to other oils we have used. Aero-1 does not thin out with heat and can be used at extremely low temperatures as well. Aero-1 will be available through QAC shortly, contact us for details. 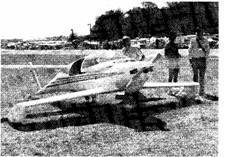 The 32nd Annual EAA Convention will be held July 28,1984 thru August 4 this year. Last year almost 800,000 people attended and the show gets larger every year. Sunday, July 29, 1984:8:45-10:00 a.m.
Wednesday, August 1, 1984: 11:45-1:00 pm. If you wish to attend, contact QAC for reservations. QAC will he awarding prizes in various categories as usual, but this year everyone who brings their aircraft to Oshkosh will receive an award from QAC. QAC must temporarily suspend our return program on unused Q2 parts applied towards Q-200 and Q2 Turbo packages. This is due to the large inventory that we have taken in trade. We will resume the program as soon as some of this inventory is sold to new customers. In the meantime anyone interested in participating in this program should write us and we will start a waiting list, first come, first served. We have been testing a new type of inlet for the Revmaster at QAC. We initially tried this “smile” inlet on theTurbo with excellent results. On the standard Revmaster experience has shown that if the engine is not lean, then the oil temp will run much closer to the limits than the cylinder heads. In using the smile inlet the cool air is much closer to the oil cooler and allows less inlet area which results in less drag and more speed. A one or two page plans addition will be developed and released shortly. Max Stupur getting a race fill-up of AVGAS - no wonder he's smiling. We have been testing a “Belly Board” drag, increasing device installed on Scott Cheney’s Q2 s/n 2062 here at QAC. While the Q2 can be landed in relatively short distances, you must come in very slowly and make very precise judgements on approach and flare. 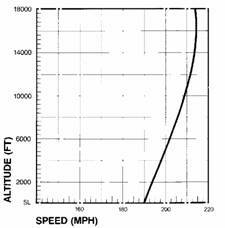 Most people tend to come in too fast and flare too high which tends to lengthen runway requirements. The belly board increases the aircraft’s drag substantially (75-100%) when deployed. What this means is that the pilot can now make his approaches 5-7 mph faster for good over the nose visibility and still touch down and stop in shorter distances. Also, if a brake failure occurred, the additional drag of the board might mean the difference between an incident and an accident. As installed on Scott Cheney’s airplane some changes in the deployment mechanism need to be made before this option can be released. Also, we have only tested this device on the new LS (1) 0417 mod canard where it does not appear to affect the stall characteristics. This may not be true for the GU canard. By the way, those of you who will be using the constant speed prop on the Revmaster will have some of the same effect when the prop is in low pitch as it should be on final. QAC has published a Pictorial Plans Addendum. This is an 8 page supplement consisting of 48 large photographs with captions. Any builder may obtain a copy by writing to QAC and requesting one. Please include your serial number. We are indebted to Jim Maris, s/n 2327, for the use of his extensive photo collection. 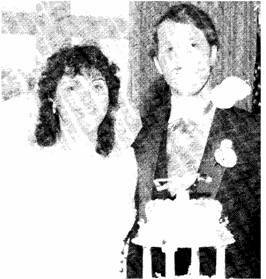 Richard and Elizabeth Kautz, married April 28, 1984. Take a close look at their wedding cake. 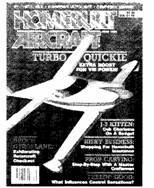 The Turbo Q2 is featured in a cover article in June ‘84 “Homebuilt Aircraft” magazine, not the July issue as we had earlier been told. 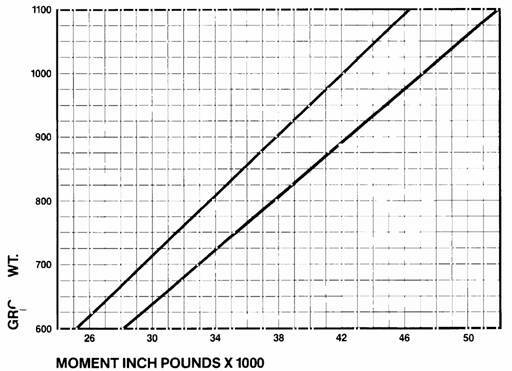 Please note the performance curves and specs in this newsletter. They are based on extensive flight testing by Eric Schilling of Revmaster. The 2 position or constant speed prop is mandatory. We recommend the constant speed over the 2 position for the Turbo. There is a 4 month backlog on the prop at this time, so plan ahead. The new canard is mandatory. The cowling for the Turbo or the prop will cost $275.00. (805) 824-4313 and (805) 824-4626. There is also a private unlisted Builder Hotline number given out only to builders. This number is for Technical Building Assistance only. The Builder Hotline hours are: Tuesday through Friday, 1 p.m.-4:30 p.m. (PST); Saturday 1 p. m.—4:00 p.m. (PST). Since the demand on this line is large, we ask our builders to have specific questions ready before calling, and not to use the line for shipping information, backorders, or option orders. In this manner, we can maximize our builder support. The Quickie Aircraft Corporation facility at Hangar 68, Mojave Airport, Mojave, CA is open Tuesday through Saturday, 9:00 a. m.-5:00 p.m. Please note that we are closed Sunday and Monday. *Ron requests that builders with backorder problems and or questions call him between 1:00-4:30 p.m. PST on Tuesday, Thursday, and Friday. This will permit him to spend the mornings on shipping, thereby providing faster service, Ron also requests that all backorder and materials requests be sent to him in writing so that he will have a permanent record in each builder file. In this way, phone calls should only be necessary for followup and or emergencies. We ask that all builders please reference their serial numbers on all communications. This will make our job much easier. Also, when writing to QAC, always send a stamped, self-addressed envelope along if a reply is necessary. Builders of both the Quickie and Q2 have the opportunity to receive rides in N81QA, our Q2, within the thirty day period prior to the builder’s first flight in his own aircraft. These rides are by prior arrangement only; in addition, at the same time, suggestions and recommendations will be given to the builder on conducting his early flights to promote safer flying. Over 75 rides have been givn to date. Each Saturday, weather permitting and N8IQA in town, we give a flight demonstration of the Q2. We usually get a large turnout on these occasions, and have been selecting an attendee’s name from the hat at random for a Q2 ride. We are doing quite a bit of flight tests on N81QA for new options and of course cannot take passengers during this period. We expect to be completed within 30 days and hope, at that time, to be back to normal operations. At least 7 of our dealers are now flying Q2s so contact your local dealer. It is important for builders to inventory the contents of all shipments within 30 days— from receipt— and to report all backorders and discrepancies to QAC in writing immediately. A builder electing to purchase Package 1A and Package lB and Package 2 together will save $300.00 at the $8500.00 combined price. The price for a complete kit purchased in the most economical manner is $l1,895.00 complete. Package 1A includes materials to construct the basic fuselage, bulkheads, consoles, etc., and to mount, and hinge the canopy. Package 1B includes the remaining materials to fabricate essentially the remainder of the airframe. Package 2 is an engine installation, instrument, and miscellaneous materials package. Package 3 is the Revmaster 2100-DQ engine. All packing of Package 1A will be done at QAC; we presently have Package lA in stock and ready for immediate delivery. Backlogs the other packages, except the engine, is 30 days. Orders on the Revmaster 2100-DQ engine will be filled in 60-90 days. Many dealers have complete Q2 Kits in stock, please call your local dealer for availability. 32.00 Oil Sump Drain Assembly. 80.00 Parking Brake option for the hydraulic disc brakes. $350.00 Custom Upholstery Set in Blue. 600.00 Carbon Fiber Spar Kit. Q2 builders should verify that they have the correct plans and updates. With either Package 1 or Package 1A, the builder should have Chapters 1-14, a Table of Contents, Appendix Sheets 1-5, Q2 Pilots Manual, Quickie Newsletters from 10 forward, and plans addendum sheets ii thru vii. 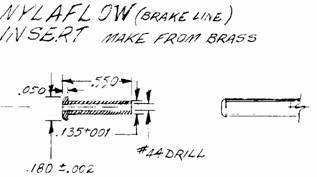 The plans for installation of the hydraulic disc brakes are on addendum sheets viii thru xii. With Package 2, the builder should have Chapters 15-20 and Appendix Sheet 6. Each non-engine option has an installation sheet that comes with it. Please drop Debbie, at QAC, a note if you don’t have everything. QAC strongly recommends that all plans changes and builder tips be inserted into the builder’s plans immediately upon receipt, so as to avoid errors. Builder tips are numbered as QBT and the Plans Change Notices are numbered as A — QPC , with the highest number being the most recent tip or change notice. A builder electing to purchase the complete Q-200 kit all at one time will save $400.00 with a $9450.00 combined price. Continental mounting hardware, spinner kit, carh heat transfer valve, 5” propellor extension, prop washer, cowling, oil separator (a must), stainless steel carb heat muff, patented AR exhaust system, fiberglass inlet air and carburetor adapter pieces, elevator and aileron counterbalance arms, engine mounts, fuel pump, sheet metal baffling kit, liquid firewall, and appropriate hardware. QAC is continuing our credit policy for returned Q2 components. See NL #20 or contact QAC for details. (1) One builder has had a problem obtaining sufficient elevator travel with the new canard (LS-1 Mod) and redundant control linkage. One area to look at is parallelism between stick and CSA-8’s, suggest no more than 20 forward of vertical axis for CSA-8 installation. (2) We think we have solved the dual master cylinder problem although haven’t tried it yet... we don’t have dual rudder or brake option on prototype since we don’t intend to use it for checkouts. Those who have purchased a dual brake option should send (one) master cylinder back to QAC (Attn: Ron) for an exchange unit. (We will proof it on a test stand first, of course). (3) Q2 builders, some have had problems with bottom accessory clearance/ mag cut-out. By maintaining about 1-2” clearance between top of cut-out bottom of top mounts, proper clearance should be obtainable. (4) Q-200 — check clamp tightness of intake tubes at regular intervals; we have had some problems on Q-200. (5) We are still receiving calls about confusion of canard sweep (LS-1 mod). You need to measure the difference between B.L. 15 and B.L. 100 (leading edge of foam cores) for a 10.5” sweep aft. Disregard any other numbers for jigging purposes. (6) Brass inserts allow wider variation of torque on fittings without chance of compression failure. Trial fit before final assembly. Revmaster has received only 8 inquiries from Quickie builders who are interested in this engine. They have decided to proceed but on a lower priority basis. What this means is that they will put it on the back burner until this fall. Unfortunately, there are very few aircraft which use engines of this size. Please contact Revmaster if you are interested. Lanny Rundell, Grass Roots Aviation, P.O. Box 21,5, Delhi, LA is supposed to fly the new Quickie canard airfoil at any time now. We will print an update sheet with full details as soon as we have the results of the testing. Assuming testing is successful, production of the carbon fiber spars will not be delayed as the same tooling that was developed for the Q-200 canard was designed to be compatible with the Quickie version. Problem: Coil wire on Quickie vibrated off (push on connector between coil and points). QAC knows of at least 150 Quickies that have made first flights. Please keep builder tips, pictures. component weight information coming in. Current prices are $3,295.00 for Package 1 and $1,700.00 for Package 2. Note that the complete kit now consists of two packages instead of the original three. 22.5 h.p. Option including Kevlar engine mount. Communications or Navigation Antenna kit. 44” diameter propeller. (Discounted price for currently flying builders). 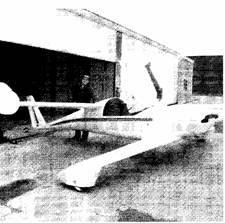 The 44” diameter propeller is to be used with the large tire option and 22 h.p. engine option. This propeller provides greater rate-of-climb (about 20%) with a loss in top speed of about 4 mph. It would be particularly useful for short fields at higher density altitudes. For those builders who would like a true climb propeller for the first few flights, rather than the cruise propeller provided with the kits, we have created a 42” diameter, 27” pitch climb propeller and will make it available as follows: with a deposit by the builder of $150.00, we will send the special prop to the builder for his initial flights. When he returns the prop to us in good shape, prepaid freight, we will return his complete deposit. Several views of this year's Sun & Fun Fly-in.